This is a 3" CD single by popular Japanese singer/songwriter Yumi Matsutoya, a.k.a.Yuming, who has been recording music since the 1970's and is now in her early 50’s. This single is from a 1989 CD series called “YUMING Sweets” that apparently featured reissues of some of her earlier 45rpm singles from the 1980’s. I'm not sure how many of these CD singles there are, but I have seen at least ten others in the XT10 series. What is special about this single is that it contains both of the Yuming songs featured on the very rare and long out of print BYE BYE JUPITER soundtrack CD (CA35-1073), released in 1984 and reviewed elsewhere on this site. 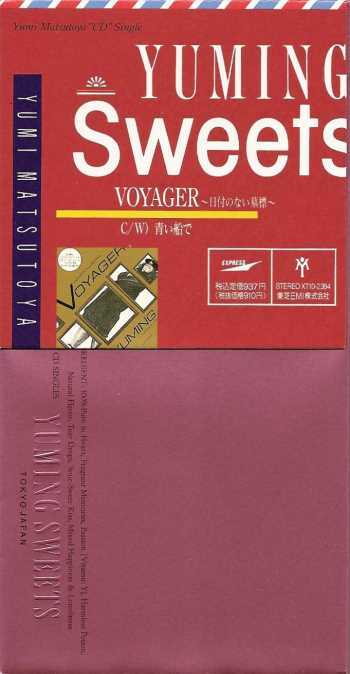 The packaging for this item is very nice - inside the pink envelope are the CD and plastic tray, plus a "Voyager" post card conveniently designed for mailing to a sweetheart. The obi, which can be seen on top, also doubles as an envelope, and is the perfect size to house the 3" disc if one wants to. Regarding the audio, the single sounds pretty good (a little richer than the 1984 JUPITER CD), but the tracks were certainly not remastered back in '89 and could use a little cleaning up. Other than the rare soundtrack CD itself, this single is the only way to get both of Yuming’s JUPITER songs on one disc.